Home / Editor's Choice, Entertainment News, Featured Articles, Forum and discussion, Gossip and Drama, News, Politics, Videos / Pastor trains his gullible congregants how they will cross hell fire and sneak into heaven (VIDEO). Pastor trains his gullible congregants how they will cross hell fire and sneak into heaven (VIDEO). Tuesday, October 2, 2018 - The church should be regulated because pastors have turned into conmen. They are faking miracles to become more popular and attract crowds to their churches. 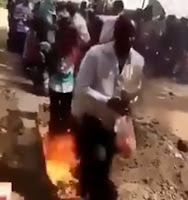 This pastor was caught on camera training his gullible congregants how they will cross hell fire and sneak into heaven. And the brainwashed idiots followed his command.